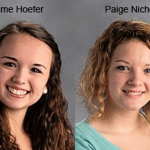 Congratulations to two Elgin High School students, earning a trip to the national FCCLA contest. National qualifiers were announced Tuesday during the Family, Career, and Community Leaders of America (FCCLA) State Leadership Conference at the Pinnacle Bank Arena in Lincoln. Elgin FCCLA members heading to the National Leadership Conference in Washington, D.C., July 5-9, are Jaime Hoefer and Paige Nichols – Gold (runner-up) Interpersonal Communication, Sr.
Tera Henkenius earned silver in Family Challenges and Issues, Sr.